In many applications, compressed air is used from start to finish, as shown here as jars exit a bottle capper. Compressed air is used in more than 70 percent of all manufacturing activities, ranging from highly critical applications that may impact product quality to general “shop” uses. When compressed air is used in the production of pharmaceuticals, food, beverages, medical devices, and other products, there seems to be confusion on what testing needs to be performed. 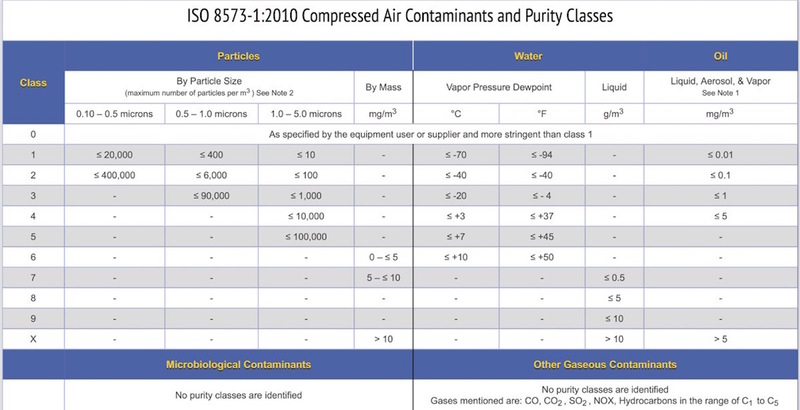 By defining compressed air contaminants, reviewing ISO 8573-1, and discussing how to designate a quality class per ISO 8573-1, this article will help clear up some of that confusion. It will also provide best practices for setting up a compressed air monitoring program. What are the Contaminants in Compressed Air? The international standard ISO 8573-1:2010 is a compressed air quality specification that addresses these very same specific contaminants by providing a range of purity classes for particles, water and oil. It does not include classes for gases or microorganisms. Jar washers using contaminated compressed air may adulterate the final product. Selecting ISO 8573-1 as the basis for compressed air quality monitoring and testing is the obvious choice, since it provides a common language that all involved parties can use. ISO 8573 consists of nine parts or sections that address compressed air quality. ISO 8573-1 is probably the most frequently cited document of the series. It includes the purity classes and a designation principle. Parts 2 through 9 provide valuable information to the interested party or analytical laboratory, and include analytical techniques and sampling methods. The purity classes are aligned with what is commercially available to remove these major contaminants. Performing a simple search on the Internet for “air compressor filters ISO 8573-1:2010” provides pages and pages of compressor and filter manufacturer advertisements citing ISO 8573-1:2010 purity classes to describe the quality of air that they can produce with their products. Many of them even have suggestions as to which purity classes should be used for various industries. The summary chart (Figure 1) below shows purity classes 0 through X for particles, water, and oil. The end user can then select a purity class for each contaminant based on either equipment installed or air quality required for a specific process or product. There should be no confusion on what contaminants and limits need to be tested, because that decision was made when compressor system filtration and point-of-use filters were selected. ISO 8573-1 does not include purity classes for gases. ISO 8573 provides testing methods in Part 6 and specifically refers to carbon dioxide, carbon monoxide, hydrocarbons with 5 or less carbons in the chain (C1 to 5), sulfur dioxide, nitric oxide, and nitrogen dioxide. If your product could be adversely affected by a particular gaseous contaminant, then it should also be addressed in your filtering, engineering controls, and monitoring specifications. Nor does ISO 8573-1 include purity classes for microbiological contaminants. Testing methods are provided in Part 7. Since there are no guidelines for microbial limits in compressed air, many manufacturers use limits established for their environmental monitoring program. Total oil purity is of particular interest, because it includes aerosol, vapor and liquid forms. For purity classes 0, 1 and 2, measurement must include oil aerosol and vapor (as well as any organic solvents in the vapor.) Oil vapors are defined as a mixture of hydrocarbons with 6 or more carbon atoms (C6+). For classes 3, 4 and X, vapors are considered optional, as there would be no significant impact at measurement levels greater than or equal to 1.0 mg/m3. Sampling and analytical methods are covered in Parts 2 (Method B for aerosol) and 5 (vapor). Liquid oil is typically only measured when wall flow is present and/or heavy contamination is expected. Sampling and analytical techniques are described in ISO 8573-2, Method A. What is not evident in the chart for particles is that there is an additional stipulation that there can be no particles greater than 5 microns present for Classes 1 through 5. Why is this relevant or important to know? Some manufacturing processes include flexible tubing or hoses after the point-of-use filters. Common rubber, nylon, and other flexible tubing can shed numerous particles that can affect product quality. This is a good example why samples should be taken at the point of use. While the compressed air quality might be perfect, adding a hose to the operation can adulterate the quality of the air being used on the final product. It is important to specify tubing or hose with low particle shedding and low water permeation properties. — Ruby Ochoa, President, Trace Analytics, LLC. Other common causes for particle count failures can be attributed to fittings, gauges, or other items using o-rings or rubber gaskets. The o-rings will deteriorate due to friction and/or age. Everyone involved — from the end user, service distributor, and compressor manufacturer, to the filter manufacturer and the testing laboratory — must use a common language when discussing clean, dry air. ISO 8573-1 Purity Classes make that easy to accomplish, and the standard is proving to be the preferred language. Air quality can have a direct effect on the final product. *ISO 8573-1 actually uses the letters ABC, but for this purpose, PWO makes is easier to remember the correct order. This indicates Class 2 for particles, Class 2 for water, and Class 1 for oil. When a class for any particular contaminant (either P, W, or O) is not specified, the designation shall be replaced by a hyphen (as seen in Example 2). This indicates that water is not classified. The use of the term Class 0 is frequently misunderstood and misused. When specifying air quality that meets Class 0, the limit MUST be included in the designation, AND it must be more stringent than Class 1 (Refer to Example 3). Class 0 does not mean that there are zero contaminants. This indicates Class 1 for particles, Class 2 for water, and Class 0 for oil with a limit of 0.001 mg/m3. When requesting filtration or analysis to Class 0, always provide a limit that is more stringent than Class 1. Is There Any Guidance on Selecting Purity Classes? [ICH Q8 (R2) II 4.0] states: "Compressed air is a Critical Process Parameter (CPP) whose variability has an impact on the Critical Quality Attribute (CQA) and therefore should be monitored or controlled to ensure the process produces the desired quality". (Source: Pharmaceutical Development – Q8(R2), International Conference on Hamonisation of Technical Requirements for Registration of Pharmaceuticals for Human Use (ICH), www.ich.org. As a voluntary code of practice, BCAS Food and Beverage Grade Compressed Air Best Practice Guideline 102 stipulates compressed air that is in direct contact with the product should meet or exceed ISO 8573-1:2010 [2:2:1] and [2:4:2] for indirect contact. It also states that compressed air purity shall be tested and verified at least twice per year and whenever maintenance work or an activity occurs that may affect the air quality (www.bcas.org.uk). What Constitutes a Monitoring Program? Document the current compressed air system in place. Include the type of compressor (oil-free, oil lubricated); type of system filtration for particle, water and oil removal; storage tank capacity; type of point-of-use filters; and material used for distribution piping (stainless steel, copper, aluminum, galvanized, etc.). Include make, model, serial, and part numbers. This information will provide insight as to the quality of air expected. Create a diagram of the compressor system, piping and outlets. Indicate type of usage for each outlet, including direct or indirect product contact, and non-product contact. If point-of-use filters are installed, indicate their location and the type of filter. This will identify which product lines must be tested and aid in preparation and selection of a representative number of sampling outlets. Document air compressor maintenance. This should include filter changes, compressor maintenance, changes or additions to the distribution piping, emergency repairs, etc. This could be useful troubleshooting information in the event of a failure. It can also be a guide in determining sampling intervals. Perform air quality testing for particles, water, oil, and microorganisms over a period of time to gather sufficient data points for a trend analysis. Ensure that a variety of points of use are sampled at various times throughout the year and are representative of air used during a production cycle. This variety in sampling is intended to catch irregularities that may occur due to weather conditions or other unknown procedures. It is also recommended to include sampling immediately before point-of-use filter changes to determine if air quality was acceptable at the end of the filter life. 5. Review trend analysis results. This will provide valuable information to either confirm or establish purity classes appropriate for product safety. A monitoring program for compressed air is not about checking an item off an audit checklist. A monitoring program should be designed to either a) confirm that air quality is meeting levels specified in corporate quality control documents, or b) identify over time the appropriate compressed air quality for the product being manufactured so that purity classes can be selected and documented. ISO 8573-1:2010 is an internationally accepted language that can be used between the compressor manufacturer, filter manufacturer, product manufacturer, and analytical laboratory to confirm the safety of compressed air used in the manufacturing process. Trace Analytics AirCheck Kit K8573NB is used for sampling particles, water, and oil. Trace Analytics developed the AirCheck Kit™ Model K8573 specifically to address the needs of today’s manufacturer. The kit captures samples for particles, water, oil aerosol and oil vapor. All samples must be submitted to Trace’s A2LA accredited laboratory for analysis. The kit is attached to the sampling outlet via a 1/4” NPT adaptor. Particles 0.5 to 5 microns in size are counted. Water vapor is determined with a detector tube while oil aerosol is collected on a set of filters. Oil vapor is collected on a charcoal tube. We offer additional samplers and methods for analyzing contaminants and limits outside of the above-mentioned parameters. For more information, contact Ruby Ochoa, tel: (512) 263-0000 ext. 4, email: ruby@airchecklab.com, or visit AirCheckLab.com. To read more about Compressed Air Quality Standards, please visit www.airbestpractices.com/standards.